Major Cramer was caught in South Normanton when he clicked his heels together and bowed, thanking a bus conductor for his ticket to Sheffield! 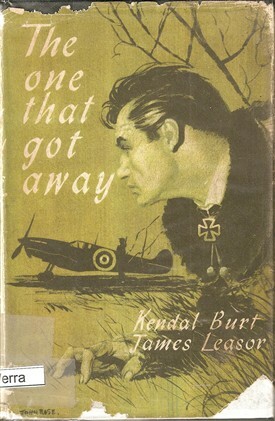 The escape of Luftwaffe Prisoner of War (POW) Franz von Werra is usually remembered as ‘The one that got away’, name of the 1956 book by Kendal Burt and James Leasor, and the 1957 film starring Hardy Kruger. That title, though snappy and evocative, is not really accurate since several German POWs did manage to get away, at least from Canada, though none made it back to Germany from Great Britain. Oberleutnant (= Flying Officer) Franz von Werra has sometimes been compared with his fellow famous German Baron, Münchausen. Certainly he greatly exaggerated his own aerial combat abilities and had destroyed far less – if any - RAF aircraft than he claimed in the Battle of Britain. His aristocratic title was also somewhat dubious, having been conferred on a distant ancestor by the defunct Austrian Hapsburg Empire in the early 19th century. 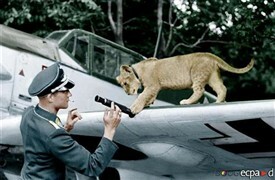 Even before his escape exploit made him famous he had already appeared romanticised in the Nazi press with his pet lion cub Simba, the squadron mascot. He was shot down over Kent on September 5 1940, successfully crash-landing his Messerschmitt 109 and quickly being made prisoner. Both the book and the film of The one that got away show von Werra’s surprise at almost immediately being taken to London to have a chat with an elderly Royal Flying Corps veteran of the Great War, rather than any young RAF pilot/ intelligence officer. The chat was mostly about politics and how the war was going, nothing to do with aircraft. This was, of course, in order to gauge exactly how ‘good’ a Nazi the prisoner was. Although it is never stated explicitly in the book, von Werra (born in 1914) appears to have been extremely loyal to Hitler’s regime, swallowing all its self-delusion, the endless lies, spite and racism that it thrived on. Yet he was personally a quite charming and plausible character. Like all escapers on both sides he believed that it was his duty to try to get back to his unit and resume fighting the enemy as soon as possible. His first attempt was made from Grizedale Hall, a POW camp in the Lake District. That was in early October 1940 when he managed to climb over a wall during the rest period of an exercise march and evaded capture for a few very uncomfortable hours on the freezing rainswept Fells. 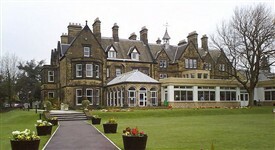 After recapture he was transferred to another camp converted out of a conference centre at the Hayes near Swanwick in Derbyshire. This was the scene of his second go at escaping which led to what the RAF called the Hucknall Incident. As is familiar from many well-known Allied escape stories, POWs could not be supervised every hour of the day. Some laxity was also shown towards officers who were prevented by the Geneva Conventions from being made to work for their captors, giving them plenty of ‘free’ time. The house at Hayes had a convenient storeroom not far from the wire, several fire buckets, scoops/shovels for dealing with small bombs and even an old forgotten cistern (to dump the dug-out earth in), giving ample opportunity for von Werra and four other enthusiastic escapees to make their bid. Their tunnel was dug between 17 November and 17 December with much difficulty, especially because of heat, lack of light and lack of air towards the end. Due to a high water level below ground it could not be as deep as they’d hoped, and they even had to go over a large sewage pipe which took them dangerously close to the surface. Ironically this led to a small cave-in just under the wire (which itself helped them by preventing a bigger collapse), but the accidental hole improved ventilation, so the tunnellers were extremely lucky. One advantage which von Werra had was that he spoke quite good English, having already visited America as a merchant seaman before the War. His ingenious plan was to pose as a Dutch Allied pilot, infiltrate an aerodrome and steal an aircraft to fly back to occupied France. Helped by other prisoners he worked out a clever cover story whereby he would claim to have been shot down while returning to a remote base near Aberdeen after a bombing raid on Denmark. Another prisoner had retained his flying suit which, along with a good pair of boots, helped provide a disguise to make this story appear more convincing. It was also a valid excuse for not having any identity papers, although he did have a forged identity ‘dog-tag’, copied in paste from one which a dim-witted guard had cheerfully shown him and other prisoners. 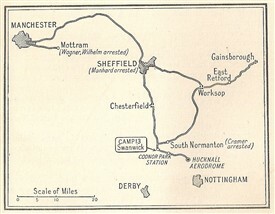 They knew that they were between Sheffield and Nottingham and that Hucknall lay not far to the south. On the night of their breakout the German officers were unwittingly helped by their comrades bombing nearby industrial centres. With some difficulty they managed to emerge unseen and, whereas the others made for big cities to the north and west – and eventually, they hoped, the coast – von Werra headed for railway lines to the south. The ‘shot-down Dutch pilot’ fiction was quite convincing to civilians, including the Stationmaster at Codnor Park who was harassed and busy issuing tickets to factory worker commuters arriving early the next morning. The problem with the story, of course, was where are the rest of the crew? and why didn’t we notice your Wellington coming down? 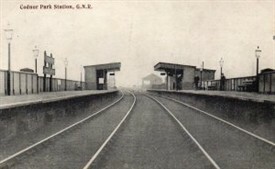 It was good enough, however, for The Great Northern Railway men and even for the C.I.D., some of whom the Stationmaster wisely called before notifying the RAF. Von Werra was surprised at how pleasant they seemed compared with the Gestapo back home in Nazi Europe. His greatest moment of triumph now came in the sense that an RAF officer arrived to collect him, and chauffeur him onto the Hucknall airbase; though that officer did take the unusual precaution of carrying a holstered pistol – not usually part of his uniform. 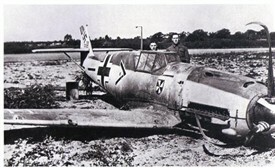 The bluffing German airman was slightly worried when he learned that most of the RAF pilots at Hucknall were Poles, though he managed to avoid meeting any of them. 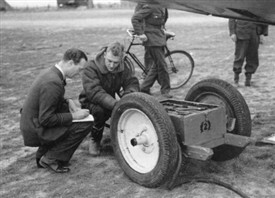 The British officers he did encounter were not particularly convinced by the’ Dutch pilot’ and deliberately kept him near a roaring fire to try to get him to remove his (suspicious, non-regulation) flying overalls. 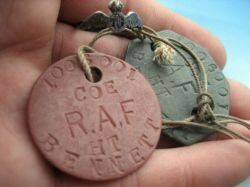 They also wanted to see the forged dog-tag – which he realised had melted into a sticky blob! While the British Duty Officer was trying to telephone the ‘Dutchman’s’ Scottish base, von Werra slipped out and made a run towards Hurricanes he had previously observed parked nearby. This was undoubtedly one of the most audacious escape attempts by any prisoner under any circumstances, war or no war, throughout history. Shortly after his second recapture – and serving 14 days’ solitary by way of remarkably lenient punishment – von Werra and all the Swanwick prisoners were transferred to a POW camp in central Canada. It was on his journey there that he did manage successfully to escape by jumping from a Canadian train while it was quite close (only about 30 miles) to the United States’ border. After many other adventures, which included stealing a large rowing boat without oars to cross the half-frozen St Lawrence River, he succeeded in reaching German Consular officials in the still-neutral USA. Helped by Nazi diplomats and German/American well-wishers he eventually returned to Germany by a very circuitous route: Mexico – Central America – Peru – Bolivia – Brazil and an Italian civil flying boat service to Vichy French West Africa, then neutral Spain, Italy and finally home. This was, of course, extremely expensive, but worth it for the Germans because he was able to bring back much useful information about British POW camps and interrogation methods. 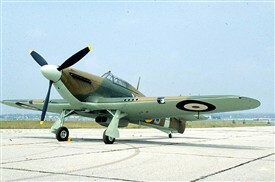 Although he was eager to return to the cockpit – especially after the June 1941 Nazi invasion of the Soviet Union when German pilots claimed vast numbers of aerial victories – they made him write detailed reports which greatly improved their security and Intellegence. He was promoted and had time to marry his fiancé, but died on October 25 1941 when his new Messerschmitt 109 F-4 suffered an engine failure and crashed into the North Sea. His body was never recovered. Nazi propaganda later lied that he had been killed in action on the Russian front. 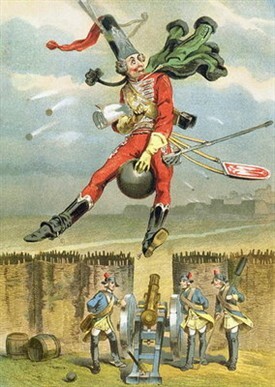 Although, as mentioned, Franz von Werra had more in common with Baron Münchausen than with Baron von Richthofen, his is still a remarkable story which deserves to be better know. A more recent German book, written with help from his sister, may yet shed more light on the wily protagonist of the Hucknall Incident. This page was added by Ralph Lloyd-Jones on 05/01/2015. In 2010 Newark Air Museum produced an education DVD about the history of aviation in Nottinghamshire, using grant money from the Local Improvement Scheme fund. The von Werra incident was included as part of the DVD. Permission was sought from Rank Films to include a clip from the film on the DVD. The fee that was requested was deemed too high so it was recreated over at RAF Coningsby by filming in one of the Battle of Britain Memorial Flight Hurricanes and also in the station guardroom. Copies of the finished DVD went to every primary school in the county and to the libraries. Luftwaffe 'Oberleutnant' = RAF Flying Officer. Thank you, Rob: correction made. Please note that if any readers would like to post 'Likes' about this, or other articles on the site, we'd appreciate it.